This level is one of hardest level of dreamworld and you need luck plus good strategy to complete this level. 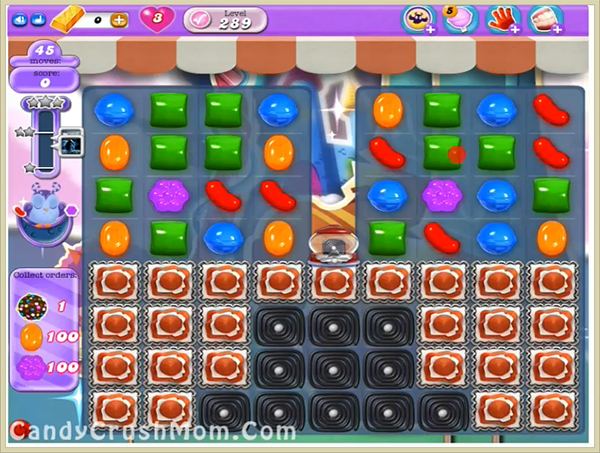 For this level you should start to break order candies plus make striped candy or wrapped candy of them and break them to break blockers so you will have more candies to play. Then use wrapped candy more or wrapped candy with striped candy combo to break more order candies with balancing the Odus owl plus as you get chance to make colorbomb then make it. If you will have good luck then you could pass this level after second moon struck. We completed this level with 64760 score using above trick and luckily reach requirement after second move plus got just single star score. I love a challenge but this level seems impossible to pass. Even using boosters like a chocolate bomb I have not come close to meeting the levels and I am left with no moves except to knock otis off and lose. I will try to wait for a lucky board but I want to also use my skills. Fix this level to gives us a fair chance. On my iPad where it shows the orders to be collected at the top there is black printing covering the orders, but I can’t read what it says. I don’t know how many orders have been collected so it’s impossible to win. Does this mean my iPad has a virus? It’s showing the same thing on my android phone. I have the same letters on my iPad. It appears there are no numbers by the orange or the purple candies. I need help too!! I too have had the target obliterated in top left hand corner, I can’t track progress during game!!! I have been on this level way too long. I am losing interest in completing it! I don’t get close to completing this thing! I have enjoyed most of the levels but this is impossible for me! I may stop playing it! Level 289 is impossible to beat been playing for a couple of months with no luck in sight. I have also been stuck on this level for months. I get near the end and Odus falls or I need more orange and there isn’t any orange on the board. I will just keep trying. Stuck on 289 for weeks, seems impossible ? ?